Latino evangelicals are twice as likely to be Republicans as are Latino Catholics. That is a far greater difference than exists among whites. Moreover, Hispanic conservatives who are Catholic favor the Democrats, while white conservatives consider themselves Republican regardless of religious tradition. To make the political portrait of Hispanics even more complex, national origin also plays a role. For some — Cubans and Puerto Ricans — political preferences are heavily influenced by ancestry, with religion playing less of a role. Those developments have led many commentators to label Hispanics as swing voters. At the very least, the results of recent elections show volatility at the margins of Latino voting patterns. The results of this study show that religion is an important factor in shaping Hispanic partisan preferences. Eligible Voters: All survey respondents were at least 18 years old. Those who responded positively when asked if they are a U.S. citizen were deemed eligible voters. Registered Voters: Respondents who said they were U.S. citizens and that they are absolutely certain they are registered to vote were deemed registered voters. This chapter examines party identification among Latinos as well as their views on how effective the two major parties are on several major issues. The analysis is made across several variables, including religious tradition, ideology, country of origin and frequency of church attendance. It also explores registration rates and views of President Bush, again across religious traditions and in relation to other factors. Comparisons with non-Hispanics are based on data from the Pew 2006 U.S. Religion Survey, using the overall U.S. population and focusing on registered voters to assure full comparability. The rest of the analysis is based on data for Latinos who are eligible to vote; that sample is larger and allows for more detailed tabulations. In this study, 43% of Hispanic eligible voters say they consider themselves Democrats, while 20% identify as Republicans and another 20% identify as independents. However, these partisan preferences vary according to religious tradition. The Democratic Party holds an advantage of nearly three-to-one among Latino Catholic eligible voters (48% vs. 17% for Republicans). Given that the Latino electorate is overwhelmingly Catholic (63%), Catholics represent the core of Democratic support among Latinos. Indeed, 70% of all Latino eligible voters who identify as Democrats are Catholics. Party identification among Latino evangelicals is more narrowly divided and slightly favors the Republican Party. Among Hispanic eligible voters who are evangelicals, 37% say they consider themselves Republicans and 32% say Democrats. In the other religious traditions, the Democratic Party prevails among eligible voters — 42% vs. 22% among mainline Protestants, and 33% vs. 8% among secular Latinos. A comparison with the Pew 2006 U.S. Religion Survey, using the same party identification measure, reveals a somewhat different interaction between partisan preferences and religious traditions among non- Hispanics. To make the most accurate comparisons across ethnic groups in the two surveys, the analysis uses data for registered voters. African-Americans represent a distinctive case because they favor the Democratic Party by overwhelming margins, regardless of religious tradition. Even among evangelicals, blacks split in favor of the Democrats by a 60-point margin. Consequently, this analysis focuses on contrasts between Hispanics and whites, two groups where party identification differs more widely by religious tradition. While Latino Catholics heavily favor the Democratic Party over the Republican Party among registered voters (55% vs. 18%), the partisan split goes the other way — though much more narrowly — among white Catholics (32% for Democrats vs. 39% for Republicans). Among Latino evangelicals who are registered voters, party identification is evenly divided (36% for each party). In contrast, the Republicans hold a two-to-one advantage over Democrats among white evangelical registered voters (50% vs. 25%). The connection between religious tradition and identification with the Republican Party reveals an interesting contrast between Hispanics and whites. For Latino registered voters, Republican support among evangelicals (36%) is twice as high as it is among Catholics (18%). Meanwhile, Republican identification among white evangelicals (50%) is less than a third higher than among white Catholics (39%). 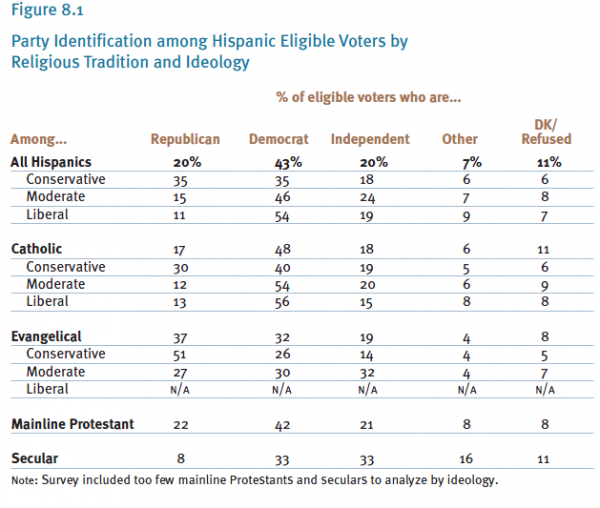 That suggests that being an evangelical might be an even more potent factor in producing identification with the Republican Party for Latinos than for whites. Comparing the relative pattern in identification for the Democratic Party shows that the same is true for affiliation with the Catholic Church. Among Latino registered voters, the share identifying as Democrats is oneand- a-half times higher for Catholics (55%) than for evangelicals (36%). Among white registered voters, on the other hand, identification as a Democrat is about a quarter higher among Catholics (32%) than among evangelicals (25%). Here, too, religious affiliation is associated with a greater difference in party identification among Latinos than among whites. Among both Latinos and whites, the Republicans do better with evangelicals and the Democrats do better with Catholics. However, in both cases the differences between Catholics and evangelicals in party identification are larger among Hispanics than for whites. The Democratic Party significantly outpaces the Republican Party among Latino eligible voters who identify themselves as liberals. Democrats also have an overwhelming advantage among Latino moderates (46% Democrat vs. 15% Republican). That is especially true among Catholics who are ideological moderates (54% Democrat vs. 12% Republican). Partisanship among evangelicals who are moderates is more closely divided (30% Democratic vs. 27% Republican). On ideology, the study’s key finding centers on the views of Latinos who identify themselves as conservatives: Conservative ideology does not automatically translate into support for the Republican Party. The Republican Party, for example, captures the loyalty of half (51%) of Latino evangelical eligible voters who identify their ideology as conservative. Latino Catholics with a conservative political ideology in fact favor the Democrats over the Republicans, 40% to 30%. In contrast, among non-Latino registered voters who are politically conservative, the Republicans outpace the Democrats by margins on the order of three-to-one in both religious traditions. Frequency of church attendance does not play a significant role in Latinos’ party preference either for Catholics or mainline Protestants, but there are interesting differences among evangelicals. The Republicans’ share of evangelicals who go to church at least once a week is 42% for eligible voters, compared with 25% for evangelicals who go to church less often. Among Latino Catholics who have converted to evangelicalism, the partisan split is more similar to that of other members of their new religion than to the faith they left. While Democrats enjoy a significant advantage among Catholics, that is not the case among these former Catholics. In their case, the party preference is nearly an even split (35% for Republicans vs. 33% for Democrats). Cubans are the only Latino group where the Republican Party does significantly better than the Democratic Party (49% vs. 24%) among eligible voters. Dominicans (50%) and Puerto Ricans (48%) are the most heavily Democratic while Latinos of Mexican descent — by far the largest country-of-origin group — also favor the Democrats (43% vs. 19%). In some but not all cases, these partisan alignments by country of origin are more significant than are associations by religious tradition. While Latino Catholics of all other countries of origin solidly favor the Democratic Party, more than half (55%) of Cuban Catholics identify with the Republican Party and only a fifth (20%) support the Democrats. Similarly, Puerto Rican evangelicals run counter to the trend among other evangelicals by solidly favoring the Democrats over the Republicans (52% to 18%). On the other hand, partisan preferences among Latino citizens of Mexican descent differ significantly according to religious tradition. Democrats have a sizable advantage among Mexican Catholics (49% vs. 14%). However, among Mexican evangelicals the partisan split goes the other way (47% for Republicans and 24% for Democrats). By significant margins, Hispanic eligible voters say the Democratic Party can do a better job of handling issues ranging from the economy and immigration to the environment and morality. Of the seven issues presented in the survey, the Democratic Party has at least a two-to-one advantage in five of them. Among all Hispanic eligible voters, the smallest margin is on improving morality, and even there the Democratic Party has an 18-percentage-point advantage. Latino evangelicals are a striking exception to this pattern of Democratic dominance on issues. On five of the seven issues, Latino evangelicals give similar ratings to both political parties. Meanwhile, the Republican Party is judged best suited to improve morality in the country, although the margin over the Democratic Party is relatively small (42% vs. 36%). And, 43% of these eligible voters favor the Democrats on the environment, compared to 33% who pick the Republicans. The patterns of partisan loyalty among Latino eligible voters of various religious traditions are mirrored in attitudes toward President George W. Bush. Catholics disapproved of the president’s performance by more than a two-to-one margin (62% vs. 27%), and the president’s ratings were only slightly better among mainline Protestants. 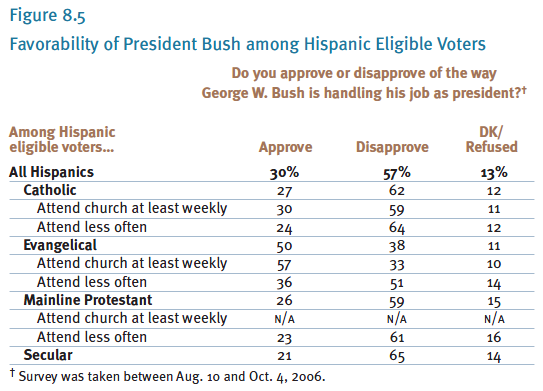 On the other hand, a majority of evangelical Latino eligible voters endorsed the job President Bush is doing (50% vs. 38%). The president did even better among evangelical voters who identify their ideology as conservative, with 63% approving of his performance. These findings are from a survey taken between Aug. 10 and Oct. 4, 2006, and the president’s approval ratings have been subject to change since then. There is a notable difference between Latino evangelical voters who attend religious services weekly and those who attend less often. More than half (57%) of evangelicals who are frequent churchgoers approve of Bush’s performance while a third (33%) disapprove. Latino evangelicals who attend less frequently split by the same proportions, but in the opposite direction (51% disapproving and 36% approving). The difference is less pronounced for Latino Catholics. Those who attend church less often tend to be only slightly more disapproving of the president than those who are frequent churchgoers (64% vs. 59%). 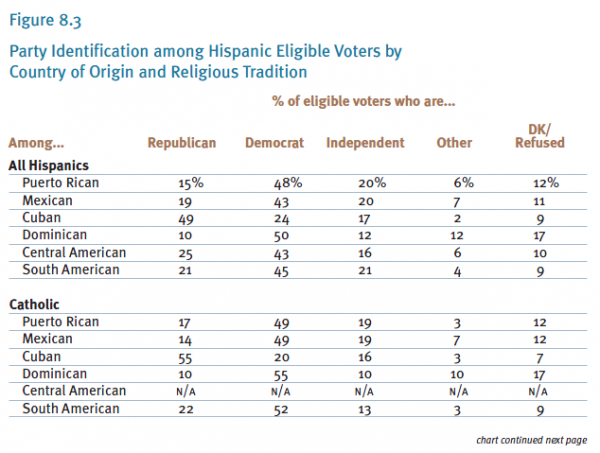 Latino eligible voters register to vote at roughly similar rates across the major religious traditions. 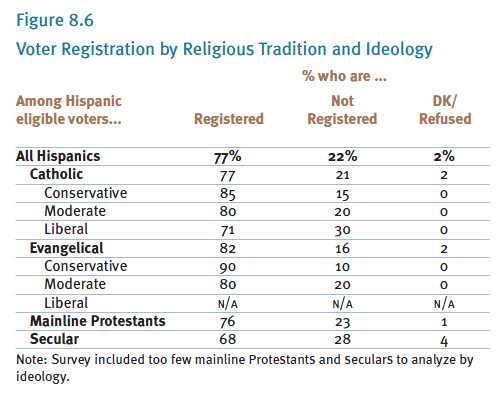 Among Catholics, ideological conservatives report higher registration rates than do liberals.